Our soul is in a constant struggle between doing good and bad. In Surah al Qiyama 75, Allah emphasises the importance of nafs al lawwamah, an inner voice of conscience which makes us feel guilty when we do wrong. It is a blessing that acts like an alarm to stop us from committing sins and warn us that there will be consequences for our actions. 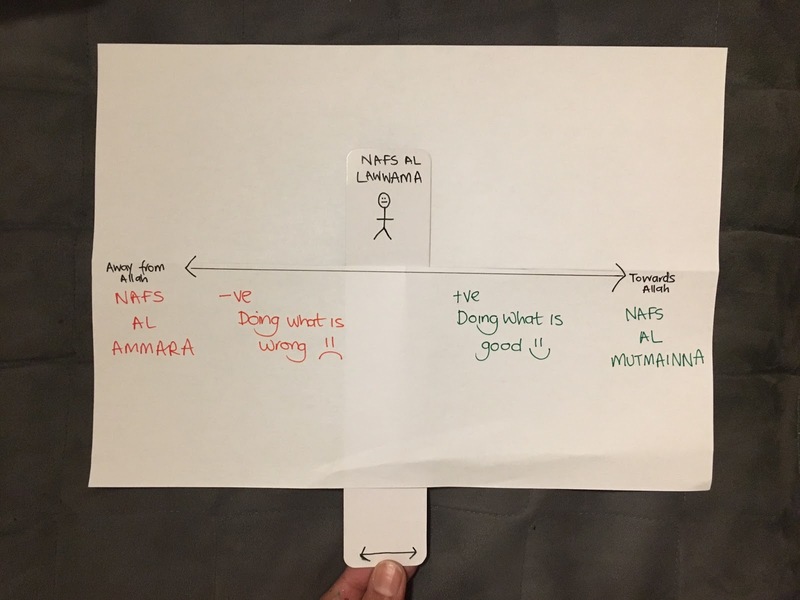 If we ignore nafs al lawwama which is trying to guide us to do right, then we become slaves of nafs al ammara which invites us to do what is wrong. If we keep ignoring nafs lawwama then eventually the voice of inner conscience will stop. Our hearts will become sealed and we will stop feeling guilty even when we commit sins. When we listen to nafs al lawwama, we strengthen our taqwa, resist sin and move towards doing that which pleases Allah. It helps us to achieve a soul with is at peace, nafs al Mutmainna. Nafs al lawwama helps to keep us on the right track and allows us to judge ourselves while in this world before we are judged by Allah on the day of Qiyama. Our belief regarding the Day of Judgement and our life in the Hereafter, gives meaning to our current life in this world. We understand that this world is a test for us from Allāh (SWT) and that we have to use our short time in this world to prepare for our true life in the Hereafter. We know that our future life is dependent on our deeds and it help us stay focused.